Flickriver takes the infinite scroll/river of news approach that Google Reader uses to display RSS feeds and applies it to Flickr photos. What you get is the ability to view thousands of photos without ever needing to hit the next button or wait for a new photo to load. The Google analogy also applies to how you navigate photos. Hit j/k to go to the next/previous photo. You can also scroll faster by hitting page down; photos will keep loading in the background so you can keep scrolling down the page and see new photos. 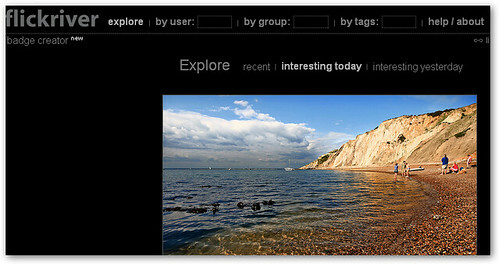 Flickr photos can be viewed by user, interestingness, tag, and group. These aren't the tiny thumbnails you're probably used to, but large images that let you appreciate each photo's intricacies. This also reduces the amount of clicking you need to do. All in all, Flickriver makes for a different and better way to view Flickr photos.